Saccharine: The best diaper bags ever! The best diaper bags ever! It's time for some eye candy! Mommy Roxi over at Mr. Jacob's Mom started a blog hop called "What's in Mom's Bag". Well I have a confession to make: I don't bring my own bags anymore. I just use Ally's. Haha. So instead of posting a photo of the contents of my bag, I'll show you the lovely diaper bags we use. Carrying a separate bag for my things is too much of a hassle for me. So I opted for a diaper bag I could tote around in style. My requirements: it has to be roomy enough for both Ally's stuff and mine, and it should not look tacky. I searched the net, and fortunately for me, I found ones that do not look like diaper bags at all! Look at these darlings, aren't they gorgeous? The first bag I bought is the lovely little Amara Day Bag in the first photo. 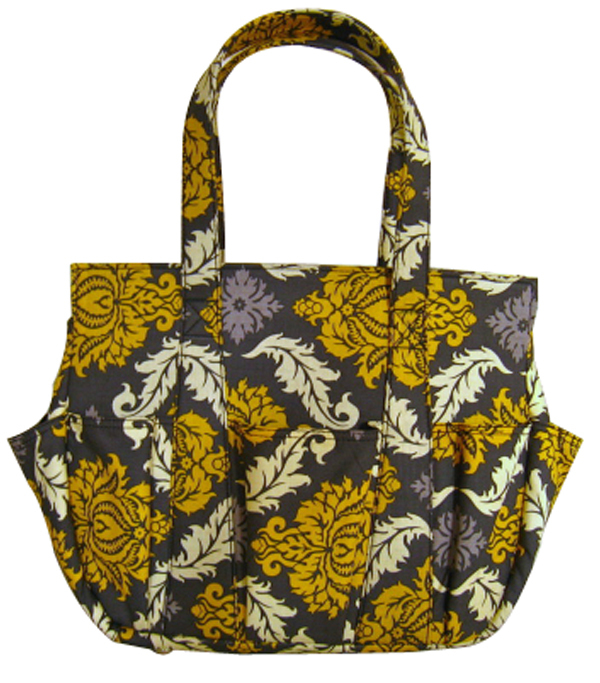 Don't you just love the damask print? I forgot who the designer is, but I will try to find out. I love how structured this bag is - it stands on its own but isn't too bulky. I realized a few weeks after I bought it that I needed a bigger bag for out of town trips, so I bought the larger Kate Overnight Bag in Amy Butler's Pressed Flowers fabric (2nd photo). This was from Nursing Mom's old collection, so I was lucky to have found the last one in Robinson's Galleria last year! The overnighter comes with a matching diaper mat - love it! This bag is a bit slouchy though, so it doesn't stand on its own. Both models have lots of pockets inside and out - perfect not only for diapers and Ally's thingamabobs, but for my stuff as well. The bags are so roomy I can stash toys plus an iPad in there. 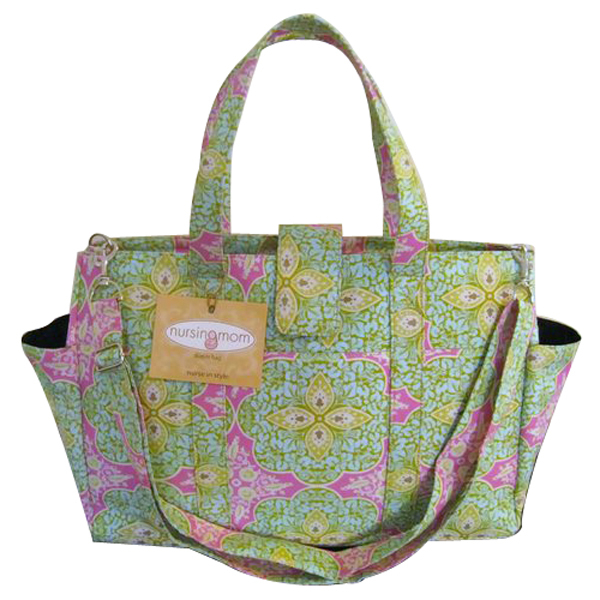 The yummy prints and overall construction make these the best diaper bags ever! My cousin even commented once that she'd love to get one for herself. She doesn't have a baby yet. Teehee! Care to share other lovely bags you've found? Please leave a comment below! I hope you liked the eye candy! very nice! these don't look like diaper bags at all! I used to buy Diaper Bags from BellyLuaghs website. Now my child has grown up so I don't need to buy stuffs like diapers and carry milk bottles. By the way, thank you for writing such a informative blog post. I appreciate it.